The Church of the Society of Jesus, known colloquially as la Compañía, is a Jesuit church in Quito, Ecuador. 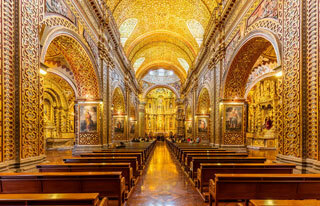 It is among the best-known churches in Quito because of its large central nave, which is profusely decorated with gold leaf, gilded plaster and wood carvings. Inspired by two Roman Jesuit churches  the Chiesa del Gesù (1580) and the Chiesa di Sant'Ignazio di Loyola (1650)  la Compañía is one of the most significant works of Spanish Baroque architecture in South America. It is Quito's most ornate church and (according to some observers) the country's most beautiful. This article uses material from the Wikipedia article "The Church of the Society of Jesus", which is released under the Creative Commons Attribution-Share-Alike 3.0 License.